Cable Companies Threaten to de-fund free speech community public access television. Save your Public Access Centers. We call upon the FCC to reject the proposal coming from Cable companies to defund our PEG channels. PEG channels provide Cable customers with the only truly LOCAL programming on their cable systems, and, at the same time, empower their customers and build community through digital inclusion, and education and access to the tools and technology needed to participate in the media landscape, something found nowhere else. PEG stations are really more of a selling point, that offers an edge to cable subscribers, a gain that comes exclusively from Cable. Why are they not seeing that? To suggest PEG is a burden to cable companies is disingenuous at best. The cost for Dish and and Phone networks is currently about the same as Cable, so to suggest PEG provisions are driving up the cost of cable may also be disingenuous. What is provided to sustain PEG is given in exchange of rights of way. ROW is something that deserves due consideration in the FCC’s decision in this process. Additionally, it should be noted that under current congressional legislation the cost for PEG is not something that has to be passed on to subscribers, the cable companies choose to do so. Public Access in Worcester has a demonstrated growing need for community participation and mainly from the disenfranchised. What happens to these people? Where is their free speech?The FCC must see the proposed rule change coming from the Cable providers as a nothing more than a money grab. If any changes are needed the Verizons , Dish networks, and the Googles, that should be giving back to support PEG as well, in exchange for the rights of way that they also benefit from. Write to the FCC and share this comment. This entry was posted in Community, Mailing List, Mauro, Shows and tagged Community Media, Exchange for Rights of Way, FCC, Massachusetts, PEG, Pubic Access, Public Access Telelvison, The People's Voice, wcca tv, Worcester on March 18, 2019 by mauro. **Democracy Now! **, aired on WCCA TV, is an ad-free news program that people can trust. The program features in-depth stories that expose government and corporate abuses of power. **Democracy Now! ** produces their daily news-hour at a fraction of the budget of a commercial news operation without ads, government funding or corporate underwriting. Support **Democracy Now! ** by tuning in to the show Monday thru Friday, from 8 am to 9 am, on WCCA TV, Channel 194 in Worcester, also streaming live at www.wccatv.com. Please support OUR efforts in continuing to bring you **Democracy Now! ** by donating to WCCA TV – no amount is too small and we appreciate your generosity and support! Donations can be made here: https://www.wccatv.com/donate or can be mailed to WCCA TV, 415 Main St., Worcester Mass. 01608. Thank you as always for your support!! Be sure to follow us on [Facebook](https://www.facebook.com/WCCA-TV-194-The-Peoples-Channel-23121410752/) or [Twitter](https://twitter.com/wccatv13). On Instagram, we are **wccatv13**. 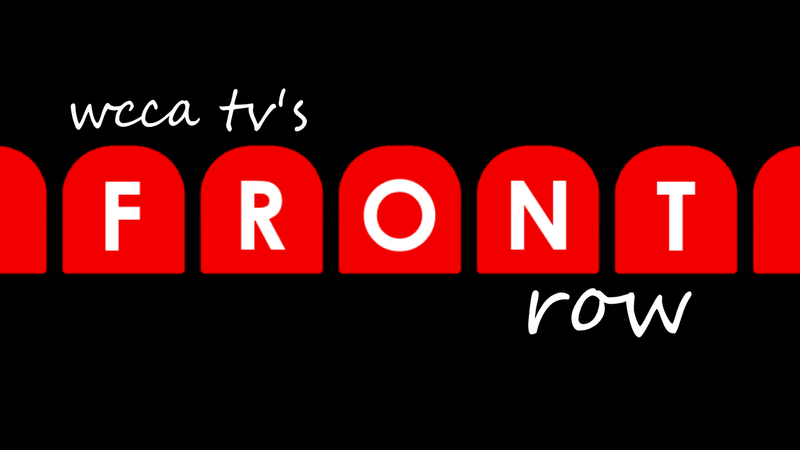 WCCA TV’s **Front Row** is a television show experience that takes you up close to live local & on-location performances, and often a look behind the scenes with in-depth interviews of talent, directors, producers, artists and more. It’s about the rich cultural experience and opportunities that exist in the Worcester area. In this episode, WCCA TV’s Adam Rice interviews Neil Berg. Neil is the creator and co-producer of **Neil Berg’s 100 Years of Broadway**, which is now the number one Broadway touring concert in the United States, playing in over 120 cities a year for the past decade. Relive the groundbreaking Rock & Roll classics of the last 50 years, as Neil Berg shares the often unknown & fascinating stories of the music that changed the world – from the beginnings of Rock & Roll in the 1940s, through the glory years of the 50s, 60s and 70s, up until MTV in the early 80s. The show will play at The Hanover Theatre in Worcester, on Saturday, February 9, 2019, at 8:00 pm. You can watch the [Interview with Neil Berg](https://www.wccatv.com/video/front-row/FRONTROW6) exclusively on WCCA TV, Channel 194 in Worcester! of [Worcester’s Kelly Square](https://www.wccatv.com/video/beacon-hill-chat/BEACONHILLCHAT287). In another episode, Senator Chandler welcomes [David LeBouef](https://www.wccatv.com/video/beacon-hill-chat/BEACONHILLCHAT286), the newest member of Worcester’s delegation to the legislature. * How should Worcester middle school students be taught sexual education? Tune in to this episode of **Rosen’s Round Table** to find out what host Gary Rosen and his panel members – Tony Economou, Hank Stolz, and Walter Bird – think about this [matter](https://www.wccatv.com/video/rosens-roundtable/ROSENSROUNDTABLE361). Exclusively on WCCA TV!! * **Activate Worcester** is a WCCA TV program that shows viewers how to participate and become active in Worcester. Host of the show Ron Motta chats Chris Pinto about MA2A, [Massachusetts And the Second Amendment](https://www.wccatv.com/video/activate-worcester/ACTIVATEWORCESTER220). * **Know Your Rights** is a WCCA TV show to inform viewers of their civil rights, hosted by Ron Madnick. In this episode, Ron talks about [LGBTQ Rights](https://www.wccatv.com/video/civil-liberties/KNOWYOURRIGHTS312) in America. In another episode, Ron talks about some of the greatest [Church/State Cases](https://www.wccatv.com/video/civil-liberties/KNOWRIGHTS310) of the last 70 years. * **Perspectives**, with Asima Silva, is a WCCA TV show that features local and national guests sharing their perspectives on politics, current events, mental and emotional health, as well as religion. Asima talks with Maysam Mutallip, Adili Yilihamu, and Abdulvares Ablimit about the [Muslim minority](https://www.wccatv.com/video/perspectives/PERSPECTIVES39) in China. * **This Is Worcester** is a WCCA TV program, hosted and produced by community activist Bill Coleman. The program focuses on interesting Worcester area facts and history. In this episode, Bill talks about [Worcester](https://www.wccatv.com/video/this-is-worcester/THISISWORCESTER72) being a city for 170 years. * New England Patriots are going to the Super Bowl again!! Tommy Colletta, host of **What It’s Worth**, welcomes Bob Perrone back to the show to talk [football](https://www.wccatv.com/video/what-its-worth/WHATITSWORTH385). Go Pats!! * **Health Matters** is a program from the Worcester District Medical Society. Host Dr. Bruce Karlin welcomes Tina Grosowsky to the show. The topic of discussion is [Quit Smoking or Using Other Tobacco](https://www.wccatv.com/video/health-matters/HEALTHMATTERS186). For more info, visit www.KeepTryingMA.org or call Smokers’ Helpline: 1-800-QUIT NOW. Because your health matters!! * **Video Jam** is your source for eclectic music videos. Your favorite host, Tracy Foley, has been presenting mainstream and indie rock for more than 10 years on cable TV public access stations. Today’s [Playlist](https://www.wccatv.com/video/video-jam/VIDEOJAM1012) features: DYK – Trashcan, Lucas Ray Exp – Sphinx, Nadia Lanfranconi – Italian Country Song, GOODING – Because It Hurts, Angela Josephine – Go Easy & Angela Josephine – 40 Days. 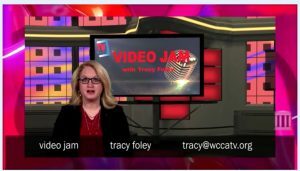 Keep jammin’ with WCCA TV! * **Senior Speak** is a program by WCCA TV in collaboration with the Worcester Senior Center. Senior issues are discussed and a good time is had by all. 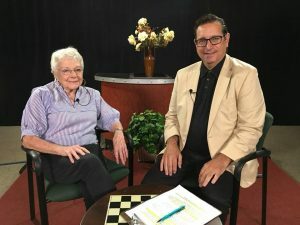 [Senior Speak](https://www.wccatv.com/video/senior-speak/SENIORSPEAK745) is recorded at the Worcester Senior Center, located at 128 Providence St., on Tuesdays at 2 PM. Stop by and be a part of the show! * **Nuestra Esperanza** is a Spanish-language [religious program](https://www.wccatv.com/video/nuestra-esperanza/NUESTRA79) hosted and produced by Lucy Tomey. This program has been airing on WCCA TV since 1990! Programación christiana de inspiración en Español, de mas larga duración en WCCA TV desde el año 1990, anfitriona y productora Lucy Tomey. This entry was posted in Community, Events, Mauro, Public Access, Shows and tagged City and neighborhood news, Community Media, Events and Information, fun, Local News, Mauro DePasquale, media democracy, media training and workshops, Public Access, Soapbox, wcca tv, wccatv.com, Worcester Local, Worcester news, Worcester TV on January 31, 2019 by mauro. 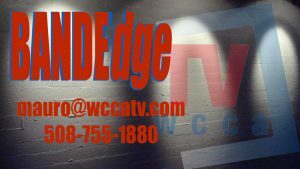 “Bandedge” recorded at the WCCA TV studio in Worcester, features local organist, Scott Olson. “Connecting the Dots” hosted by attorney, Liz Myska, is a non-traditional legal program with the emphasis on the attorney as a trusted advisor. “Soapbox”, hosted by Mauro DePasquale, will feature Richard Gonzalez of Net Compassion, a faith based collaborative effort of volunteer groups bringing vital support services to people in need in our city. “Got It Covered” hosted by Victor Infante features Sean Ryder as he performs My Best Friend by Air Supply. What It’s Worth hosted by Tommy Collettta will feature Emily Rosenbaum, the Executive Director of the Worcester JCC to discuss the JCC gym. This entry was posted in Community, Events, Mauro, News, Public Access, Shows and tagged Community Media, fun, MA, Mauro, Meaningful telelvision, Picks of the Week, TV, wcca tv, Worcester, Worcester Community Public Access Television on November 7, 2018 by mauro. Do you have a question for Buddy The Elf? 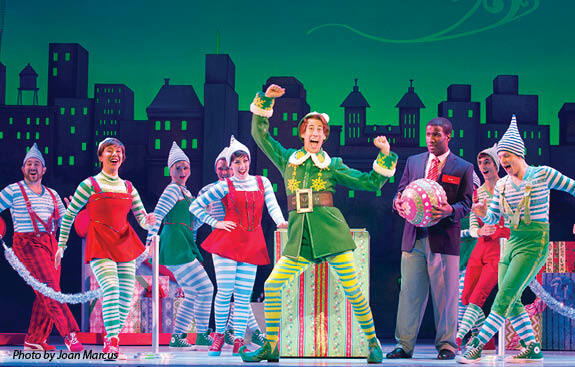 WCCA TV’s “FRONT ROW” will be interviewing Buddy, The Elf when he comes to Worcester’s Hanover Theatre on November 10! Do you or your kids have a question for Buddy? Send it to tracy@wccatv.com and we just might ask YOUR QUESTION on air! Based on the beloved 2003 New Line Cinema hit, ELF the Musical is the hilarious tale of Buddy, a young orphan child who mistakenly crawls into Santa’s bag of gifts and is transported back to the North Pole. Unaware that he is actually human, Buddy’s enormous size and poor toy-making abilities cause him to face the truth. With Santa’s permission, Buddy embarks on a journey to New York City to find his birth father, discover his true identity and help New York remember the true meaning of Christmas. This modern day Christmas classic is sure to make everyone embrace their inner ELF. 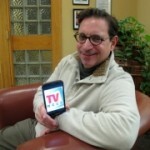 Tune into WCCA TV “The People’s Channel” 194 or at www.wccatv.com for upcoming episodes of FRONT ROW. This entry was posted in Events, Shows on October 19, 2018 by webmaster. 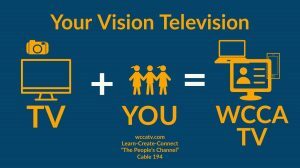 WCCA TV mission is to EMPOWER Y O U ! More than SOCIAL MEDIA or having someone video tape you. WCCA TV mission is to EMPOWER Y O U through charitable Community Media ! While there are new and inexpensive ways to produce video, Public Access television facilities still allow people to produce video in a higher quality and shown to a very broad local audience or a targeted audience. While you can put a video out on YouTube, the chances of it being seen by significant numbers of people is still very small. Commercial platforms ( social media or otherwise ) place their own profit before your interest, they can be intrusive and they are not truly free speech. They often express rights to censor, delete and or terminate post or video. to suit their own bottom line. WCCA TV provides access it is commercial free, and it is truly PARTICIPATORY MEDIA at it’s highest. All ages, and people of all backgrounds, are welcomed and encouraged to join in the creative fun of building community through electronic media. There are still some financial obstacles to producing video. Although the technology to produce a decent quality video has increase significantly over the years, there are still many people that simply do not have access to the cameras to shoot the video, or to the computers to edit the video, or to the internet to upload the content. Many Public Access media or television facilities, such as WCCA TV, also provide technology training and media literacy programs to help new producers make quality video productions and to discern most effective messaging. Sometimes these productions are later shown on other channels, such as PBS, or picked up on other platforms supplemental to Public access presentations. This renders a higher benefit to our participants that may not be available to others. Numerous public access volunteer producers and interns often go on to careers in video production, become media specialist, or simply enjoy the creativity of physically networking in a creative collaborative space with other like minded creators. Also WCCA TV curates community media productions as the video art of our time, as historical and cultural artifacts. WCCA is non-commercial (a charitable 501(c)(3))and dedicated to a mission that is inclusive, participatory, free speech ( free from political whim, or corporate retribution ), and to empower the Citizens of our City and beyond. WCCA TV is THE place to LEARN, CREATE, and CONNECT like NO other. Become a member or help support us today. This entry was posted in Community, Events, Mauro, News, Public Access, Shows, Youth and tagged Arts and Culture, Community, Creative arts, Creative spaces, culture, Free Speech TV, fun, Massachusetts, Public Access TV. Community media, TV, wcca tv, Worcester, Worcester Television on October 4, 2018 by mauro. WORCESTER HITS IT OUT OF THE PARK ! ” Home Run City ” Welcome the WORCESTER RED SOX ! WORCESTER HITS IT OUT OF THE PARK ! City officials and a development team including Governor Baker and Lieutenant Governor Polito, Mayor Petty, City Manager Augustus, and others including the franchise owner of the (soon) former PawSox, Larry Lucchino and Rhode Island attorney James J. Skeffington, have announced to a over full City Hall Chamber, the good news about the “WORCESTER RED SOX” will be moving into Worcester, ushering in along with it, a nice cash infusion to aid in further developments in the area. Although this is exciting news for the city, WCCA TV hopes to see strong support continue for Worcester’s BRAVEHEARTS. The Bravehearts sent out a press release by owner John W.S. Creedon, Jr., President of the Bravehearts Baseball Club, expressing concern regarding the possible negative impact this new baseball team might have upon the Bravehearts. Let’s hope both teams can flourish and that the momentum of the Bravehearts does not dwindle. More to come stay tuned to WCCA TV. You heard it first hear. WCCA TV The People’s Channel. WCCA TV is a regional leader serving Worcester’s community media public access needs and an anchor institution that stands for Media Democracy, Media Literacy and Creative Innovation. Learn, Create and Connect at WCCA TV. Since 1986, WCCA TV has always been a creative space and a place that has engaged people of all backgrounds in bringing the city to life through creative expression of storytelling, engaging community television talk programming, music, dance, television journalism, dramatic arts and film/video making, public art and multimedia works, and to exercise free speech. It’s a space for everyone to get engaged in the arts in an active way. A diversity of thousands of people attended WCCA educational class and workshops, participated in content creation, our public events, and our programs are seen in Worcester and around the world on line. Check out our amazing Video On Demand library! ALL VIDEOS ARE AVAILABLE FOR FREE “ON-DEMAND VIEWING” at http://www.wccatv.com/video . This would not be possible without such an amazing video-prolific community and also with the tremendous work and effort of our own WCCA TV staff of professional video technicians and video production artist. WCCA community projects and programs are seen around the world and we have many letters expressing appreciation of this from many different countries. BRAVO !! There is no denying WCCA TV is an anchor institution that stands for Media Democracy, Media Literacy and Creative Innovation. NOTE this blog may be updated and the views and opinions expressed in the news articles embedded herein are not necessarily those of WCCA TV, it’s Board of Directors, It’s Staff, It’s sponsors and associates. This entry was posted in Community, Events, Mauro, News, Public Access, Shows and tagged baseball, City and neighborhood news, Community Media, Events and Information, fun, kelly square, Local News, Mauro DePasquale, media democracy, media training and workshops, pawsocks, Public Access, Soapbox, wcca tv, wccatv.com, Worcester Local, Worcester news, Worcester Red Socks, Worcester TV on August 17, 2018 by mauro. This entry was posted in Community, Events, Mauro, News, Public Access, Shows, Tracy and tagged City and neighborhood news, Community Media, Events and Information, fun, Local News, Mauro DePasquale, media democracy, media training and workshops, Public Access, Soapbox, wcca tv, wccatv.com, Worcester Local, Worcester news, Worcester TV on August 15, 2018 by mauro. with an in-depth interview with local actress GRACE LESLIE. John, a fabulous pianist, plays her accompanist Cosme McMoon. where Grace has done many of her other plays and musicals. From there the show goes on the road to California. ” WCCA TV’s FRONT ROW is a television show experience that takes you up close to live local and on location performances, and often a look behind the scenes with in-depth interviews of talent, directors, producers, and artist and more. It’s about the rich cultural experience and opportunities that exist in Worcester area. This entry was posted in Community, Events, Mauro, News, Public Access, Shows and tagged City and neighborhood news, Community Media, Events and Information, fun, Local News, Mauro DePasquale, media democracy, media training and workshops, Public Access, Soapbox, wcca tv, wccatv.com, Worcester Local, Worcester news, Worcester TV on August 9, 2018 by mauro. It is with deep sadness, All of us at WCCA TV mourn the loss of our dear friend and colleague Sidney (Sid) Dorfman. 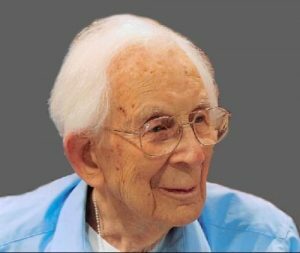 Sidney A. Dorfman,99, died on the evening of Sunday, August 5, 2018 in the Jewish Healthcare Center. He was Husband to his wife of 71 years, Phyllis, who died in 2014, a father, grandfather, a WWII Veteran. He was also a business owner of the Warren Oil Company and the Home Oil Company, many also remember him as “Sid the Oil Man”. He was a prominent figure in community theater as an actor and writer. Sid was an outstanding volunteer, and long time member of WCCA TV host of his own show “SID SAYS” and a senior Anchor person for “WCCA TV COMMUNITY VISION NEWS” and “TV 13 NEWS”, and he also participated in producing many Public Service announcements (PSA’s). His friends and associates at WCCA TV bridged all age gaps. He is loved and will be missed. He always brought a smile to the conversation and to the Television screen. Our prayers and condolence go out to his family especially his children Robert, Ellen, and all his many grandchildren and great grandchildren. God rest your soul Sid. This entry was posted in Community, Events, Mauro, News, Public Access, Shows and tagged Eisenberg Assisted Living, Obituary, Sad news, SID DORFMAN 99, Sidney Dorfman, WCCA, wcca tv on August 7, 2018 by mauro.